Phifer’s broad range of Exterior Sun Control products are designed to absorb and dissipate 65-90% of the sun’s heat and glare before it reaches your windows or glass doors. This results in a more comfortable indoor temperature, more efficient air-conditioning, and better energy conservation. Studies have shown that shaded windows can save up to 25% on the cost of air-conditioning when compared to the unshaded alternative. 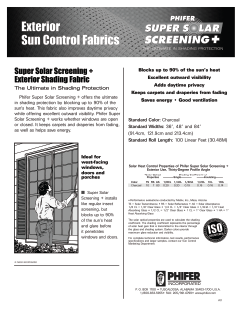 Phifer Sun Control Screen products still function as conventional screens in addition to their heatreducing properties. They protect against insects and offer good outward visibility. 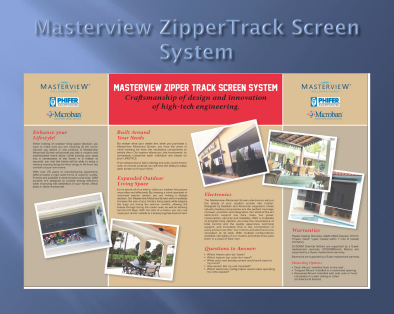 They can be installed as exterior shades, door screens, enclosure screens, or for use in retractable exterior shade systems. SunTex is a unique woven mesh that can block 80-90% of the sun’s hot rays before they enter your window. Its exterior shading fabric is made of strong, vinyl-coated polyester, and it’s pet-resistant. SunTex is also mildew- and fade-resistant, and needs only an occasional cleaning with mild soap and water. SunTex 95, engineered for exterior roller shade applications, is a full basket-weave vinyl-coated polyester fabric that is thinner and lighter than traditional SunTex. 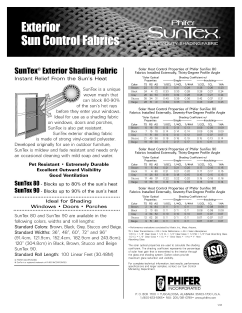 With a 5% openness factor, SunTex 95 offers increased heat and glare control as well as daytime privacy. Phifer Super Solar Screening + is a specially woven vinyl-coated fiberglass fabric that offers the ultimate in shading protection by blocking up to 90% of the sun’s heat. Super Solar Screening + helps keep carpets and draperies from fading while allowing excellent outward visibility. SunScreen® is the original woven solar screen fabric. It is made of vinyl-coated fiberglass yarns and is designed with a unique ribbed weave that can block up to 70% of the sun’s heat and glare. SunScreen stops insects but will allow gentle breezes to enter the home when the window is open. Natural light can enhance the function of any room with proper sun management. Phifer’s SheerWeave fabrics are designed to provide high performing solutions to the sun’s harsh rays. Our broad range of sun control fabrics reduce solar heat gain, protect against damaging UV and improve the comfort of any interior space. Suitable for the home, office, business, hospitality, healthcare, education, government and retail locations SheerWeave fabrics are durable and easy to maintain. 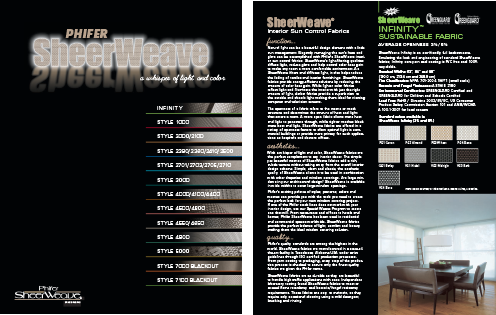 Quality made in the United States, SheerWeave fabrics are the perfect complement to any decor.